The nice thing about finding the area of a surface of revolution is that there’s a formula you can use. Memorize it and you’re halfway done. So multiplying these two pieces together is similar to multiplying length and width to find the area of a rectangle. In effect, the formula allows you to measure surface area as an infinite number of little rectangles. For example, suppose that you want to find the area of revolution that’s shown in this figure. 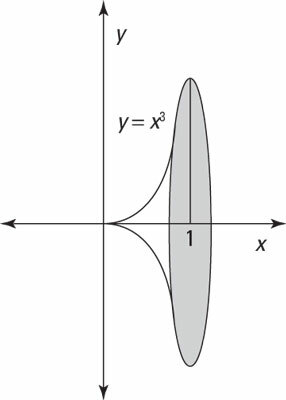 Measuring the surface of revolution of y = x3 between x = 0 and x = 1. Notice that you change the limits of integration: When x = 0, u = 1. And when x = 1, u = 10.